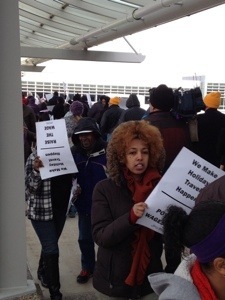 Yesterday, at the Minneapolis-Saint Paul Airport, cabin cleaners, wheelchair agents, baggage handlers, and other service workers joined the millions across the country to say enough. They join fast food workers whose employers advise them to supplement their income with welfare, Walmart employees seeing their own stores holding food drives for employees impoverished by their Always Low Wages, and retail janitors who clean Target stores in Minnesota, tired of Target pushing the absurd lie that they have no control over the cleaning subcontractors they hire. We are all asking: shouldn’t a person working 40 or more hours a week expect at a minimum to not live in poverty? 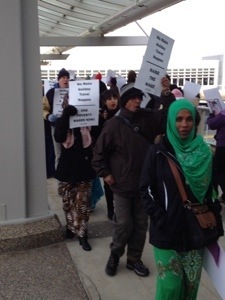 At MSP yesterday, workers sought not to make passengers traveling to see family feel guilty. In fact, quite the opposite. They know the average flyer is not traveling first class and is frustrated by airlines so brazenly putting profit over all else. Passengers paying ticket prices kept high by Delta’s virtual monopoly at MSP, paying ever-increasing fees for baggage, some of whom can no longer get free water on a flight, wonder when they’ll start charging us for the air we breathe. We should all also ask where all that money is going when the airlines insist on paying poverty wages to workers who keep airplanes clean and safe, who help disabled passengers get from plane to gate. And when large, profitable corporations pay poverty wages with no benefits everyone is hurt. Just like that McDonald’s employee urged to go on welfare by his own employer, the companies paying poverty wages at MSP shirk their responsibilities onto the rest of us. At Local 26, the union these airport workers are organizing to join, we did a study of the impact of poverty wages at the MSP Airport. The combination of low wages and no health coverage means that many of the families of airport workers must rely on taxpayer-funded safety net programs in order to survive. The report estimates that $1.7 million a year is spent on public benefits because these contractors pay poverty wages. The MAC prides itself on being able to raise enough revenue that it does not require general tax support, but in the case of these passenger service workers, taxpayers are subsidizing the contractors through things such as public assistance, medical care, food stamps, and low-income housing. Today I am thankful for the courage of these workers joining their voices to the chorus of discontent in this country. They have had to fight for the simplest things, like being provided with more than one pair of hygienic gloves while cleaning airplanes. Think about that. Until recently, workers were forced to use the same pair of gloves to clean those often filthy airplane bathrooms when they cleaned the rest of the plane and replaced the pillows and blankets you wrap around your body. Their employers finally began providing more gloves, hoping perhaps that would quell their demand for decent wages and benefits. But they fight on. During today’s holiday and tomorrow’s “Black Friday” shopping frenzy, let us all remember the workers who make holidays happen. Like you, they are being asked to do more and more for less and less. While their employers, like yours, become richer and richer, they live in poverty. And all of us, together, must fight on.